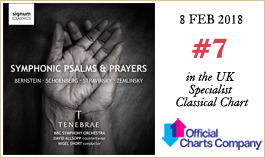 Joined by the BBC Symphony Orchestra, Tenebrae performs contrastingly iconic responses to the Book of Psalms by Stravinsky, Bernstein and Zemlinsky, plus Schoenberg’s fiendishly unaccompanied Friede auf Erden. With trumpets and well-tuned cymbals. The musical and prayerful richness of The Book of Psalms inspires vastly differing offerings from composers with a myriad of approaches to combining the two worlds of the symphonic and the choral. The results are works which defy categorisation and stand the test of time with audiences and performers alike. There are certain giants in the musical repertoire which are unmistakable, either because they do not fit neatly into a category or because they are simply so distinctive as to be etched on our collective musical memory. The result of a commission by the Boston Symphony Orchestra to celebrate their 50th anniversary of foundation, the Symphony of Psalms could be thought of as a compromise. Its publisher had ambitions for a popular work, although the definition of popular might be the first liberty taken by Stravinsky in supplying the goods. The Boston Symphony Orchestra requested a symphonic work, as suggested by their name, and it might be that Igor Stravinsky fulfilled the requirements with his tongue in his cheek. It all depends on how you define the word: symphonic. This piece is in a slightly unlikely musical format but it has become widely-known and hard-wearing, maybe because of its individuality. He clearly did not just provide a pot-boiler for popular appeal. One look at the chosen texts might be enough to put off the listener before the music begins. No feel-good choice of psalms where all sounds well with God, the Psalmist and Creation. In fact, if the listener were on the edge of giving up hope of good relations with the Almighty, then the snippets of Psalm 38 are full of supplications of inadequacy, even a little despair, relieved with a small dose of hope and trust in the promises of the Lord in Psalm 39. Only in the setting of the complete Psalm 150 is there what might be described as a conventional approach to linking the virtues of God with the joys of singing, illustrated by some of the more usual biblical instrumentation: trumpets and well-tuned cymbals. Even then, it is not always a happy sing-along: an ominous hint of menace underpins the words Laudate and Alleluia in the final movement. It should not be forgotten that the Book of Psalms is, after all, a song book and David himself, the psalmist, is referred to in the subtitles of many of the individual psalms as 'The Choirmaster'. Now for that tricky word: symphony. The traditional understanding is a certain way of piecing musical form together and a way of developing themes. Yet the original meaning of the word symphony suggests sounds which go well together, and Igor Stravinsky might have had this idea in mind when he provided a format which is miles away from the symphony as we know it. The commissioning orchestra would have known that Stravinsky had already produced works such as the Symphony in E flat from his youth, the Symphony of Wind Instruments, Symphony in C and the Symphony in 3 movements. But now he produces a completely different, three-movement choral symphony in neo-classical style which the musical world has held in high esteem ever since. There are further arguments for his use of the term, symphony in the sense of balance in music. There is harmony and intricate writing in equal roles for orchestra and choir; certainly not a choral work with just orchestral accompaniment—much more a dialogue. We can see and hear classic textures of choral writing: the double-fugue of the second movement with clear echoes of polyphony in the third section. But there is another depth to the package which perhaps explains its universal appeal. 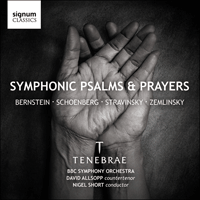 There is the composer’s own ritual darkness in the flavour of much of the orchestral colour, an unmistakably Russian-Orthodox aroma, coupled with the use of the psalms of the Jewish faith in their Roman Catholic translation. Difficult to pin down, but there seem to be tolling bells in there—nothing as obvious as orchestral bells, but even the opening chord gives the impression that ritual activity is about to take place. Maybe it is the repeated Es throughout, like a tolling bell, at different pitches which keep the first movement rooted somewhere, in a vague sense of worship. Much of the centring around this note is chanting rather than normal melody, almost a monastic restriction for the voice in austerity, pandering neither to the audience, nor to the singers themselves. Bernstein’s Chichester Psalms was one of the many enlightened and imaginative commissions of the Dean of Chichester Cathedral, Walter Hussey which resulted in this somewhat unconventional work for the Southern Cathedrals Festival of 1965. Picture the raised eyebrows at an American Jewish composer with a leaning towards the sounds of Broadway writing a setting of psalm selections in Hebrew for the English Cathedral world. This was a culture in which the appearance of risqué biblical texts and the tones of the saxophone (Walton’s Belshazzar’s Feast) or the use of War Poetry in a religious work (Britten’s War Requiem) ruffled the Establishment’s feathers. Still, this unique jewel in the repertoire has become recognised as an illuminated expression of the message of the psalms set, as well as a possibly-unintended commentary on the timeless struggles of mankind and, maybe more specifically, conflict among different nations. There is no conventional approach to the combination of choirs and orchestra—first the use of a solo boy in a lower range than the typical, floating-chorister role is a distinctive marker. This exacting, vocal part has the option of being taken by a countertenor, and since the persona represents the psalmist himself, the boy David, Bernstein stipulated that it was a male-only domain. The orchestral forces, while omitting woodwind, make the most imaginative use of strings, brass, percussion, but most of all a major role for two harps. The biblical references alone grant these instruments a heavenly part, and the composer himself made their importance clear at an initial rehearsal by treating the rest of the forces to a play-through by the harpists alone. The percussion lends colours and metrical and rhythmic dimensions which would have seemed at least refreshing in the intended setting of an English cathedral. In the event, the actual premiere was in Philharmonic Hall, New York City shortly before its unveiling in Britain. The legendary percussionist, James Blades had an important consultative role in adapting the instrumentation for an economy version by the composer for organ, and one player each on harp and percussion, and this has contributed to the work’s widespread following ever since. There are three movements, each using selected verses from the Hebrew Psalms, identical except in some details of verse-numbering to the psalms chanted and recited daily in churches and monasteries in all of Christendom, so the work serves as an essay in ecumenism, whether that was the intention or not. The best-known of these psalms is the central movement which depicts God as the Good Shepherd, tending his flock. The opening is essentially a call to praise God and rejoice in Creation, with a paean of praise in what is known in the Christian Liturgy as the Jubilate. After the comforting words of the central section, the third movement delights in a Divine optimism of comfort and hope, with an appeal for unity at the close, echoed in Bernstein’s use of a unison close in voices and orchestra. There is a risk in the world of choral singing to undertake works which demand just a little too much of the singers. The talents required in Chichester Psalms should not be underestimated, written with rhythmic complexity and interval-calculations which, even in the 1960s would have come as a shock to members of choral societies or church choirs. All the voices, including a short section for a SATB quartet near the end, have huge demands made of them, in technical terms both vocal and musical. The major part of the first movement is in 7/4 metre, itself a counter-intuitive sensation for musicians. There is a predominance of the interval of the seventh, especially between the lowest two voices—a tricky relationship for the ear to gauge. The use of this number is specific to the symbolism of that number in the bible. In the Book of Revelation alone this number is used 54 times. We are perhaps accustomed to such references as ‘sevenfold grace’, the seventh day: the Sabbath, seven divisions of the bible, seven angels, seven trumpets, seven seals, that they go unnoticed. I cannot help pointing out that the modern harp has seven pedals to alter the pitch of the strings and that the musical octave, despite the name, has seven letter-named notes. That might be sufficient on the subject on paper; the feel of it is in the musical effect. Bernstein made a motivic use of an angular shape heard at the outset which consists of a downward fourth, rising seventh (as discussed above) and a descending fifth. This gets the transformatory treatment throughout the work, binding it together through its various moods and messages. Curiously, I find it rather close, at least in the elements of the fourth and the seventh, to the principal theme of Mahler’s Symphony of a Thousand, ‘Jupiter’ from Holst’s The Planets and even, most surprisingly, to the introduction to the 1964 theme for Star Trek, composed by Alexander Courage. You cannot take Leonard Bernstein, the composer of big tunes, taut rhythmical interplay and glitzy instrumentation out of a commission for an ecclesiastical festival—he succeeded in merging two contrasting worlds in a work which grabs the attention of the listener and has proved to be a hard-wearing favourite among choral singers. Alexander von Zemlinsky’s Psalm 23 (The Lord is my Shepherd) is in a fantasy style, painting a musical picture to match the echoes of the pastoral mode of this psalm text where God is likened to a shepherd. About one half of the Book of Psalms in the Bible was written by (King) David who was once a shepherd himself. In the Hebrew headings for many of the psalms, there are the inscriptions: ‘A Psalm of David’ and ‘To the Choirmaster’. Therefore it is hardly surprising that the words of Psalms are a ready resource for composers. Think of it as a very, very old book of lyrics. Arguably, Psalm 23 is the best-known in the whole collection of 150 psalms and maybe its popularity is because it is not so much a prayer asking God for gifts or graces, but rather it expresses contentment and trust in what the Lord has provided on earth and has promised for the future. Zemlinsky paints a picture in music with some of the optimism of Gustav Mahler’s choral works and a little of the religious fervour of his teacher, Anton Bruckner. There is also a forward-looking use of chromatic harmony which sounds almost like an introduction to the composer Arnold Schoenberg. There is an immediacy to his way of transforming imagined, pastoral scenes into colourful melody and harmony which is direct and appealing. Some of the influences in his style are easily traced in Zemlinsky’s own life. Born in Vienna with a mixture of Catholic, Muslim and Jewish cultures, his three psalm-settings make up almost all of his sacred music compositions. He intended to marry Anna Schindler had Gustav Mahler not got there first but, despite this domestic upset, Mahler was still chosen to conduct the premiere of Zemlinsky’s Opera, Es war einmal (Once upon a time) and it might have been Mahler’s music which was the inspiration for Alexander’s sweeping phrases and arching climaxes. Yet, alongside his conventional harmony in the mould of Wagner and Brahms, it is the ground-shifting chromaticism which points us to another family connection: Schoenberg married Zemlinsky’s sister Mathilde in 1901, and 1907 was the year of both the composition of Schoenberg’s Friede auf Erden and the marriage of Zemlinsky to Ida Guttman. After formative years immersed in the music of the Jewish faith, Zemlinsky had converted to Protestantism in 1899, the same year that he took up the position of Kappelmeister at Vienna’s Carltheater. Another similar post followed in 1906 at the Vienna Volksoper so this creative burst of choral works is perhaps not entirely surprising and his three psalm-settings rank among his finest works. The use of the oboe in the orchestral introduction of Psalm 23 is perhaps an obvious choice, since this instrument has been used since the Baroque period to suggest the countryside as depicted in the words of this psalm. The vocal lines retain a certain folksong simplicity and the use of mainly higher voices lends an angelic feel to the mood. The harmonic language becomes more chromatic and sensuous as the psalm’s valley of death approaches and rustic spice is added to the sumptuous instrumentation, with glockenspiel, harp, piccolo and cymbals emphasizing the rather high-lying world of the shepherd, suggesting those instruments (timbrel, pipe, harp etc.) which feature so often in the Book of Psalms. For those who know the sound of the bridge passage before the Chorus Mysticus of Mahler’s Symphony No 8, there are little hints of this sound-world in Zemlinsky’s Psalm 23. The two works were premiered in the same year and it is worth recalling the esteem in which Zemlinsky held Gustav Mahler.